“Just follow your nose”, my guide Sara had said to me, and sure enough, soon I was standing in front of the massive marquee proclaiming ‘International White Truffle Fair‘. 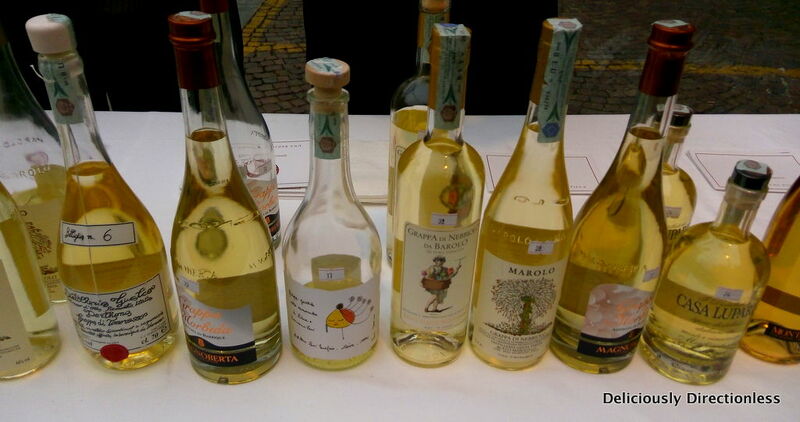 The 85th edition of the fair has recently concluded in the tiny town of Alba, in Piedmont, Italy. 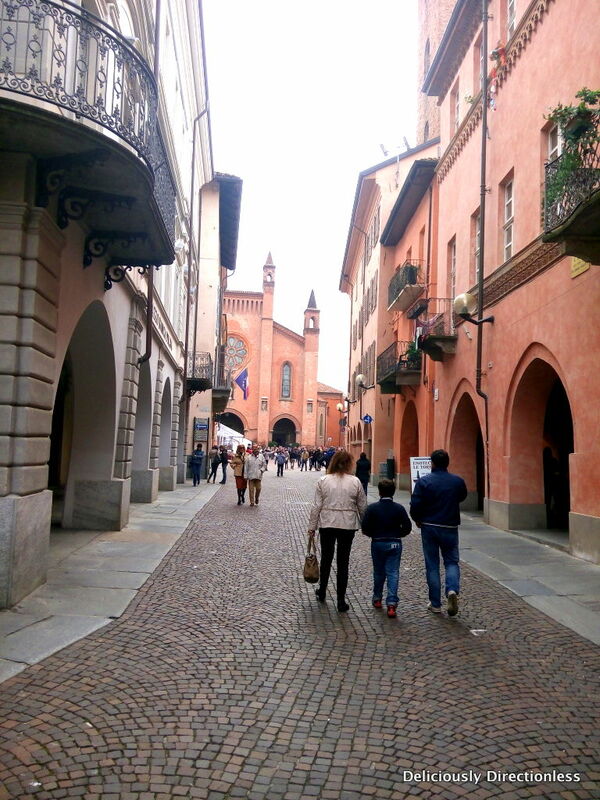 And I found myself reminiscing about my trip there last year.Towards the final leg of our month-long trip around Italy, the husband and I arrived in Turin for a few days. 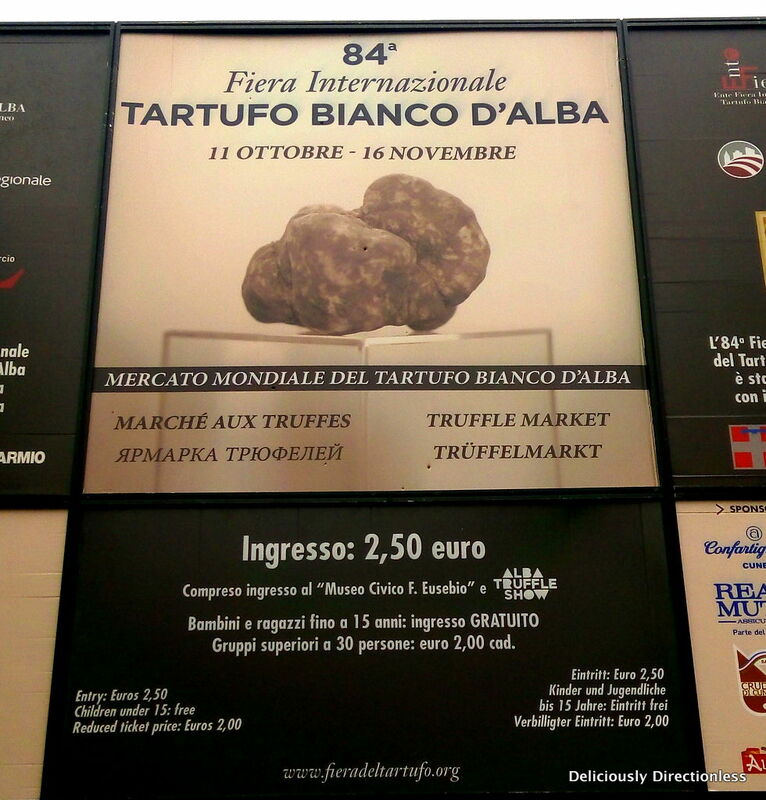 Since it was autumn, and high truffle season, I was keen on heading to Alba for the truffle fair. 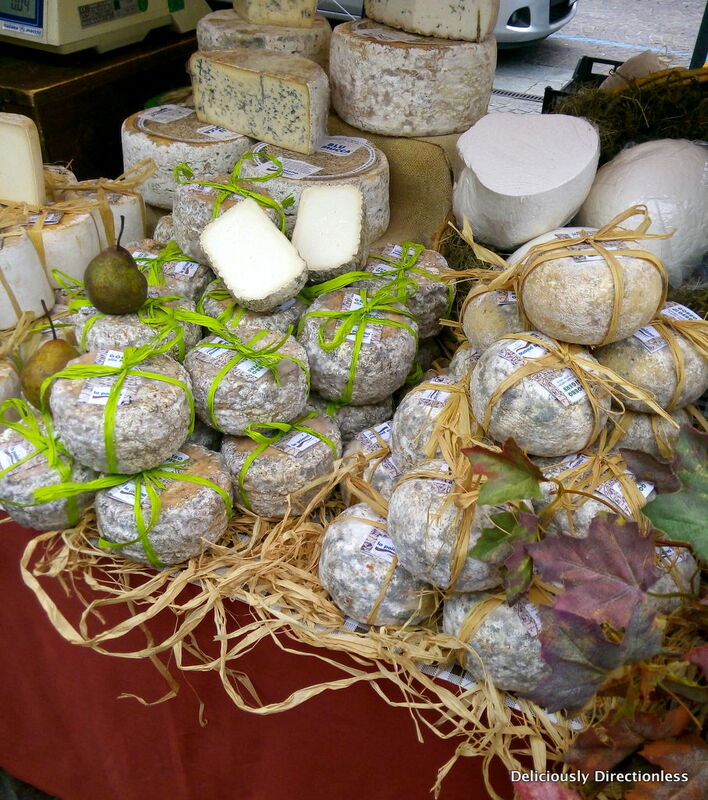 We had already been on a fun truffle hunt in Acqualagna, Le Marche, and I couldn’t get enough of its heady scent! 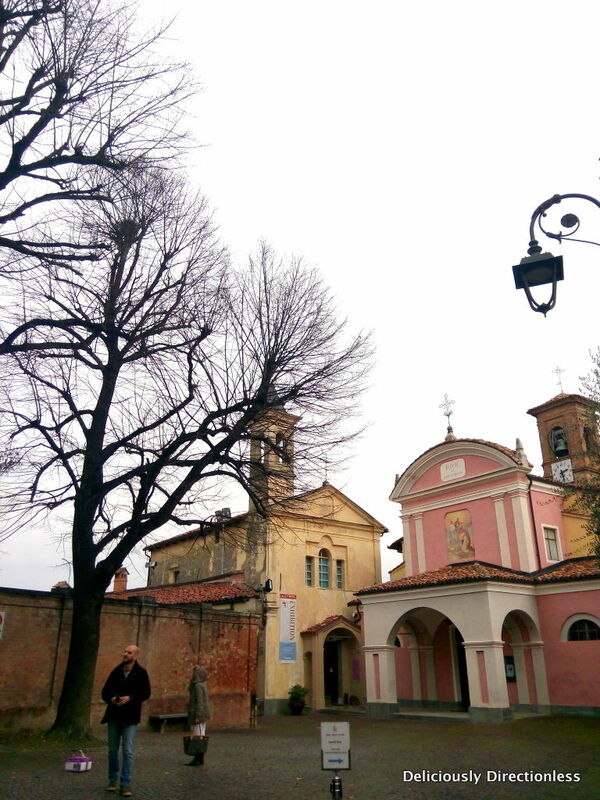 So one Sunday I found myself on a train from Turin to Asti, where Sara from Wonderful Piemonte was to pick me up and take me on a guided tour around Alba and the Langhe area. 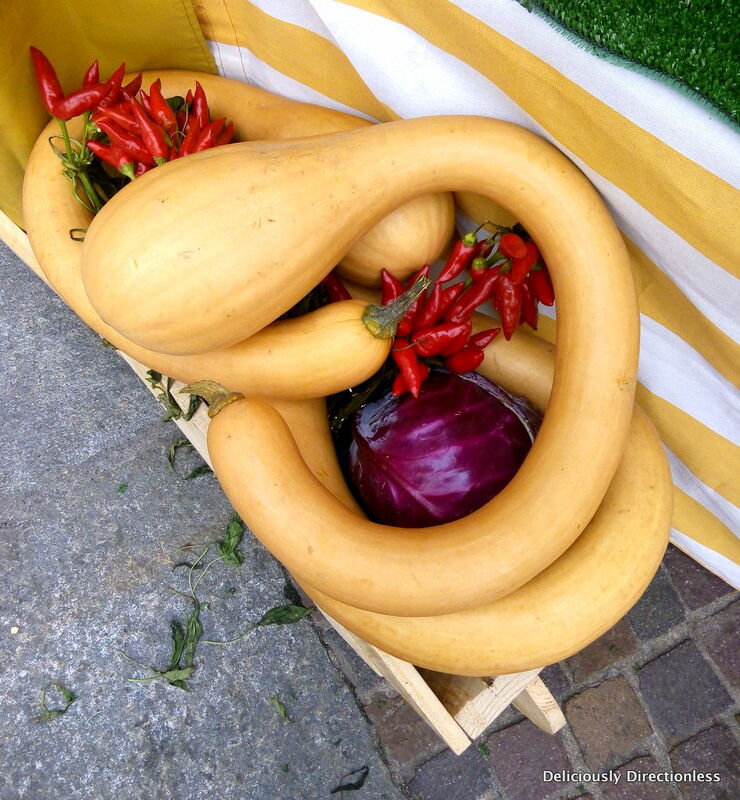 We drove from Asti, past rolling hills, vineyards and the odd town or two, and arrived in Alba, just as the Sunday farmers’ market was being set up. 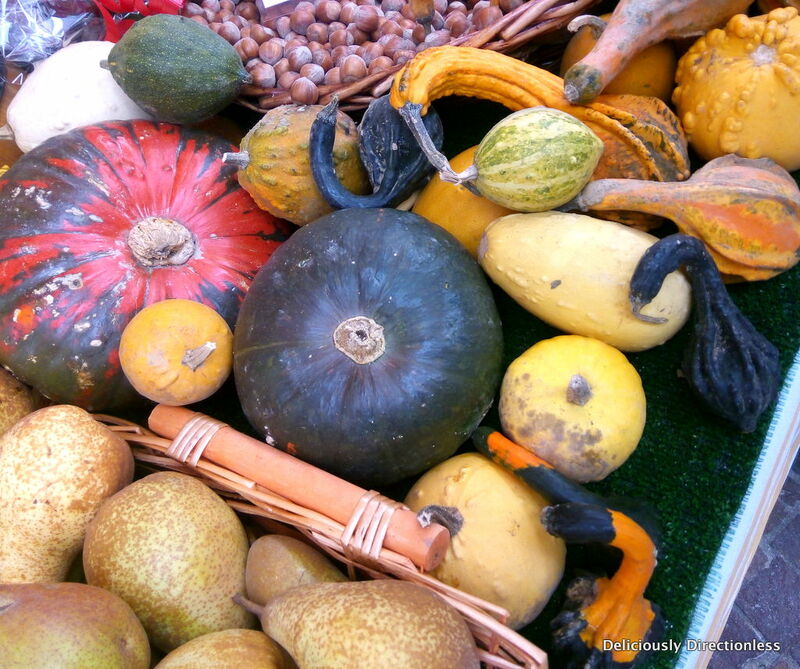 We browsed around the stalls, heaving with various varieties (and shapes) of squash, local salame and cheese. Present-day Alba stands on the site of the ancient Alba Pompeia, a Roman town dating back to 9 BC. You can see some Roman-era remains around the town, but most of the today’s Alba dates to the middle ages. It’s a charming little town, with cobbled streets and a smattering of medieval-era houses and towers – Alba was once known as the ‘City with hundred towers’, much like Ascoli Piceno in Le Marche. The 12th-century Alba Cathedral (Duomo), dedicated to the patron saint San Lorenzo, stands tall in the historic city centre (pictured above). 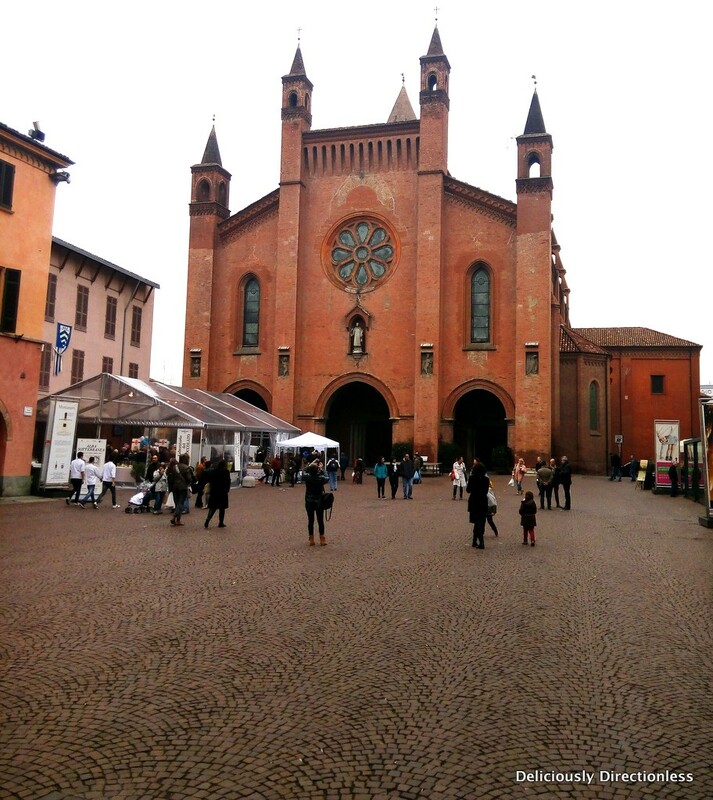 It’s a beautiful Romanesque church and worth a visit. 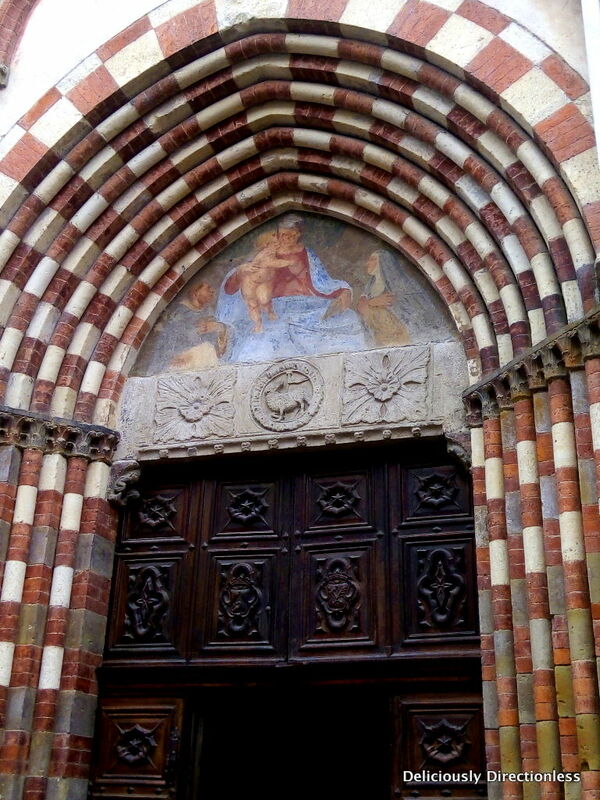 But the church I would recommend most is the Gothic church of San Domenico (pictured above). 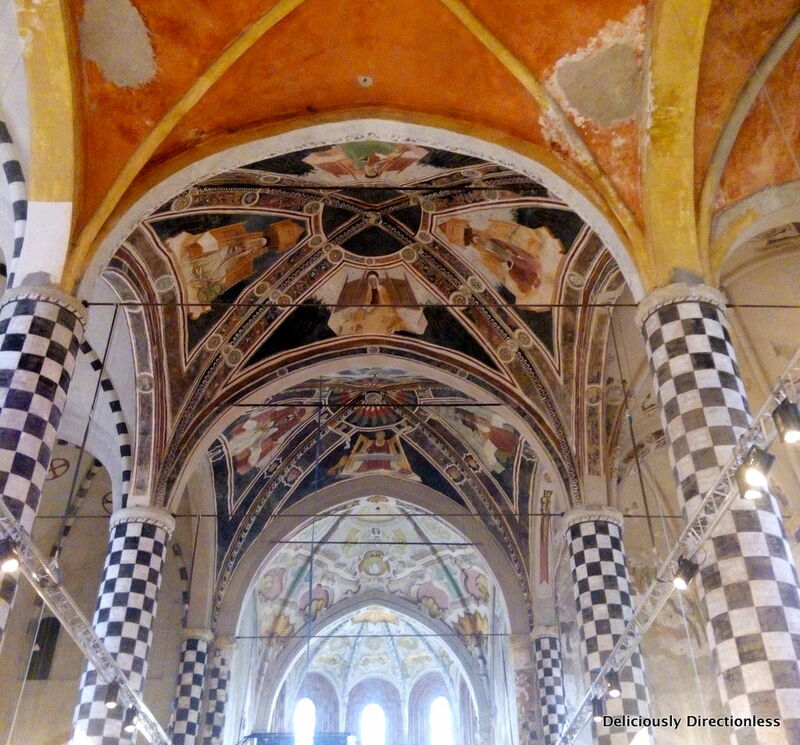 Inside the 13th-century church there are several stunning frescoes on the walls and ceiling, which have recently come to light and are being restored. 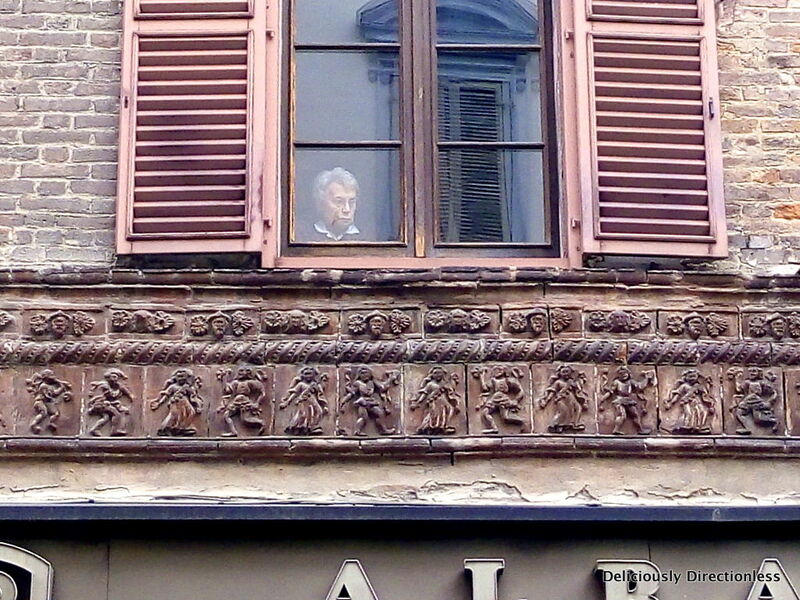 The frescoes were covered with seven layers of paint, having been repainted over the years. 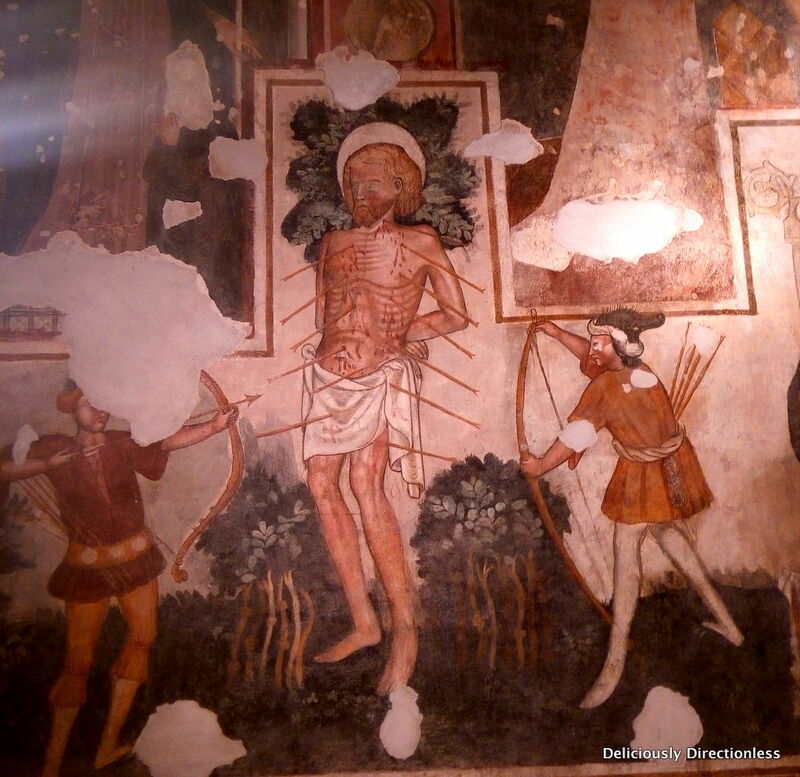 There are Nativity scenes of course, and one striking fresco of the martyrdom of San Sebastian. The church is not used for religious services anymore; instead it’s a venue for exhibits and concerts. There was a photography exhibition on when I visited. 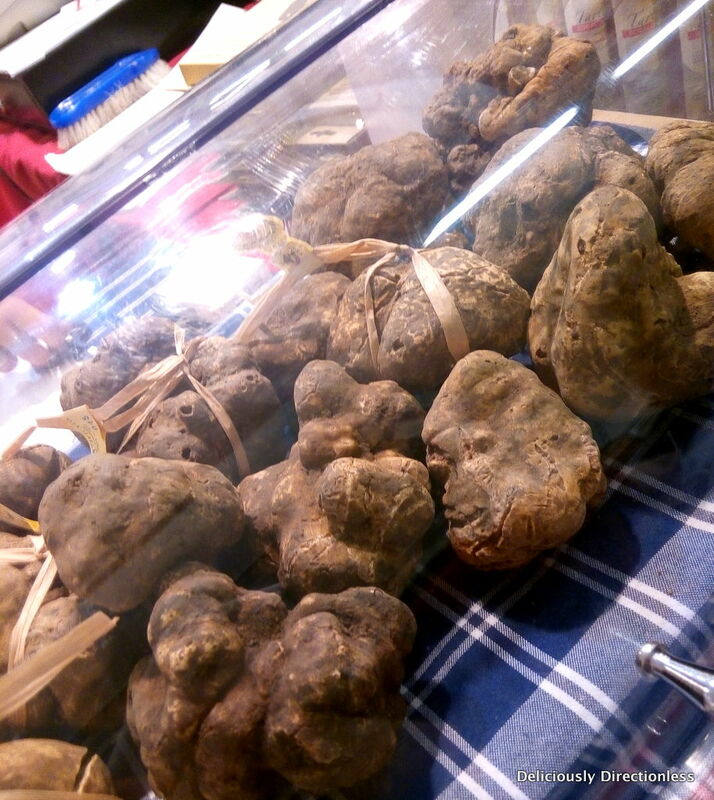 We then followed our noses and arrived at the truffle fair. 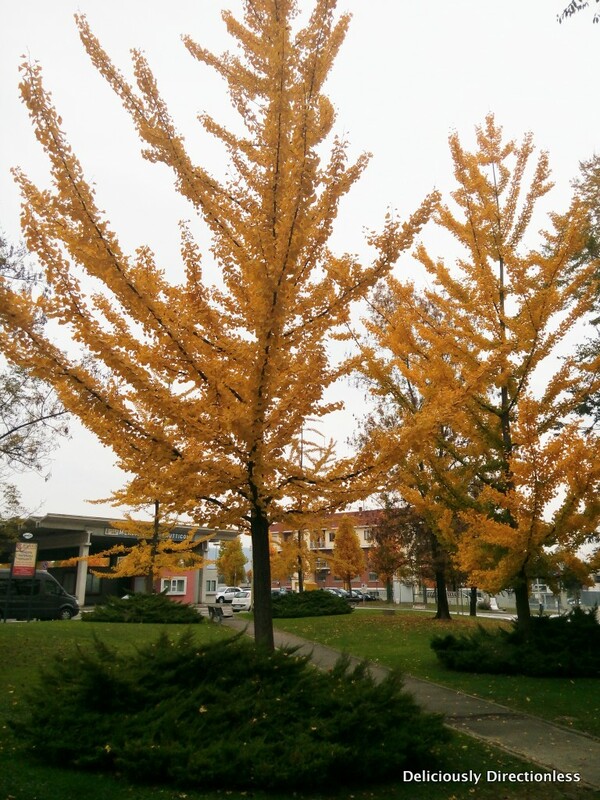 The air was so redolent with truffles, it was almost trippy! 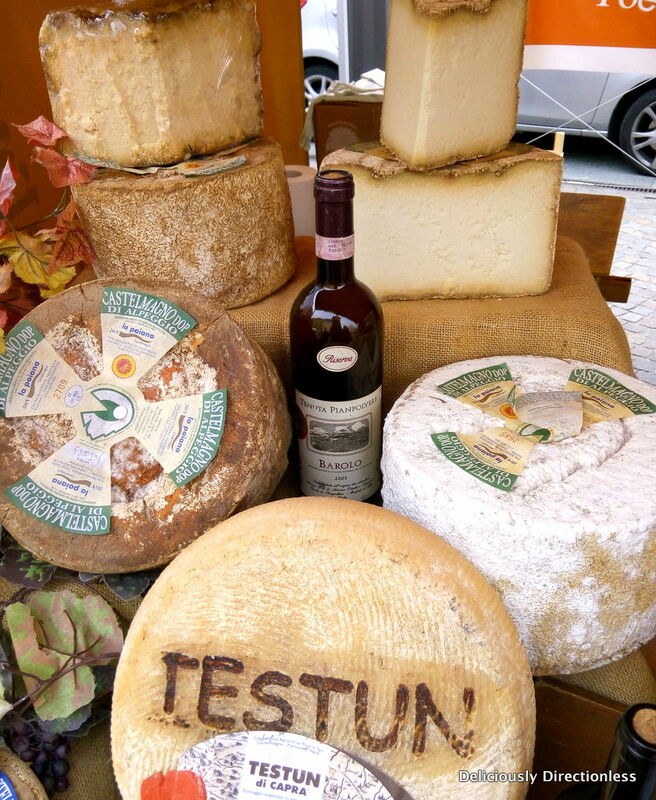 For an entry fee of €2.5, you can sample several truffle products, cheese, wines, and other local products. 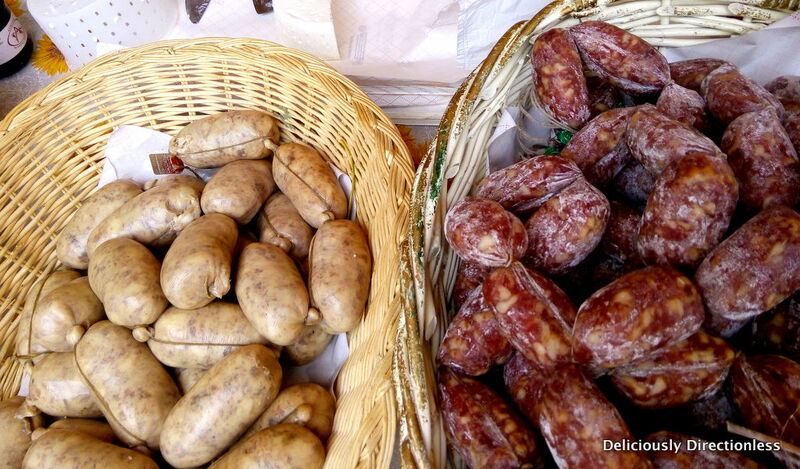 And of course buy truffles or truffle products such as oil, salt and paste. I brought back some truffle infused pasta to make a simple buttered pasta dish at home. 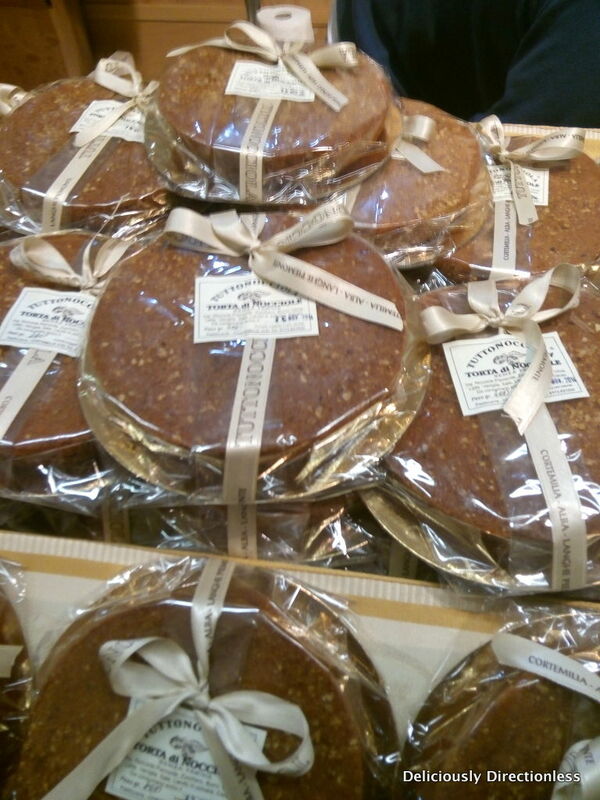 I bought another local specialty – torta di nocciole or hazelnut cake. Hazelnuts grow in plenty in Piedmont, which is probably why Ferrero (of Nutella and Ferrero Rocher fame) was founded here. The hazelnut cake is slightly dense, not too sweet and goes perfectly with a cup of coffee. I had a plateful of tajarin pasta – a Piedmont specialty pasta, very thin and rich with lots of egg yolks in the dough. 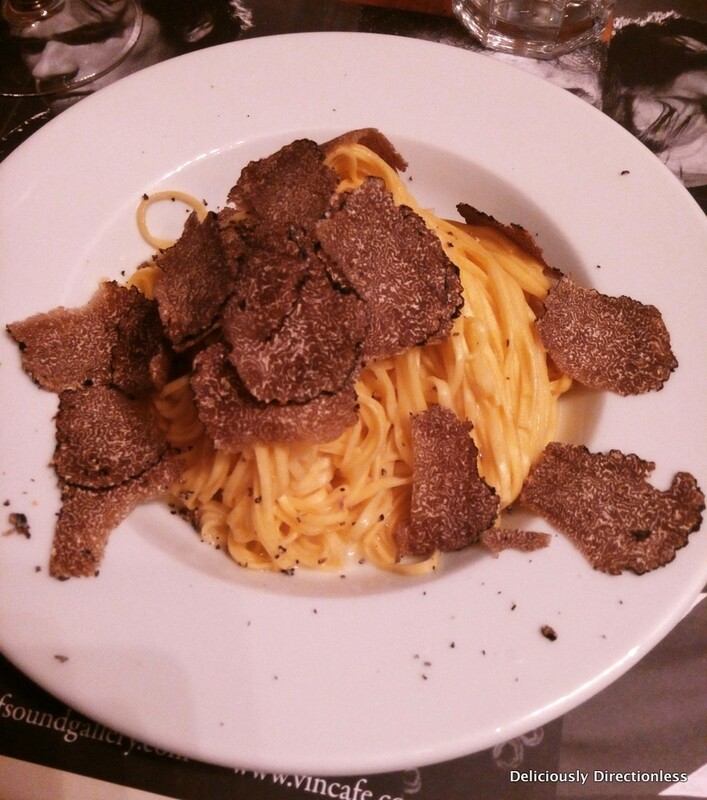 The pasta was tossed lightly in butter and generously topped with fresh, shaved black truffle – heaven on a plate! I paired the pasta with a crisp glass of Arneis, a white wine from the Roero hills of Piedmont. 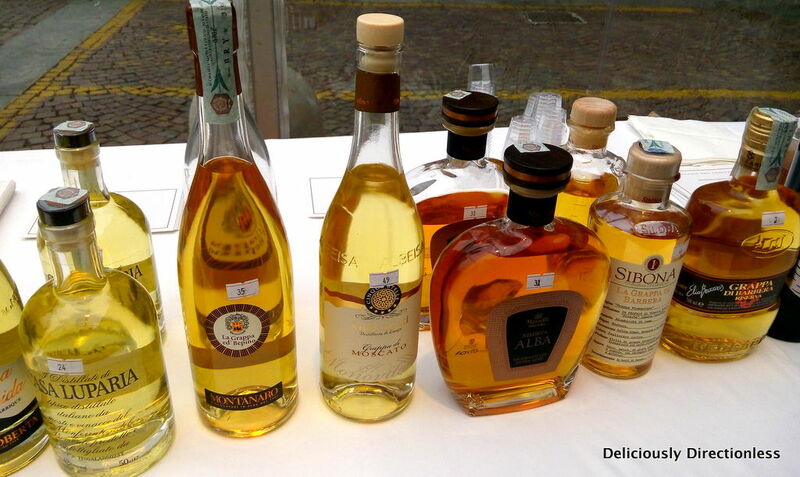 Before heading out of Alba, we also stopped by at the Piazza Duomo to sample a variety of local grappa, which ranged from almost colourless to a deep amber, depending upon how long it’s been aged. 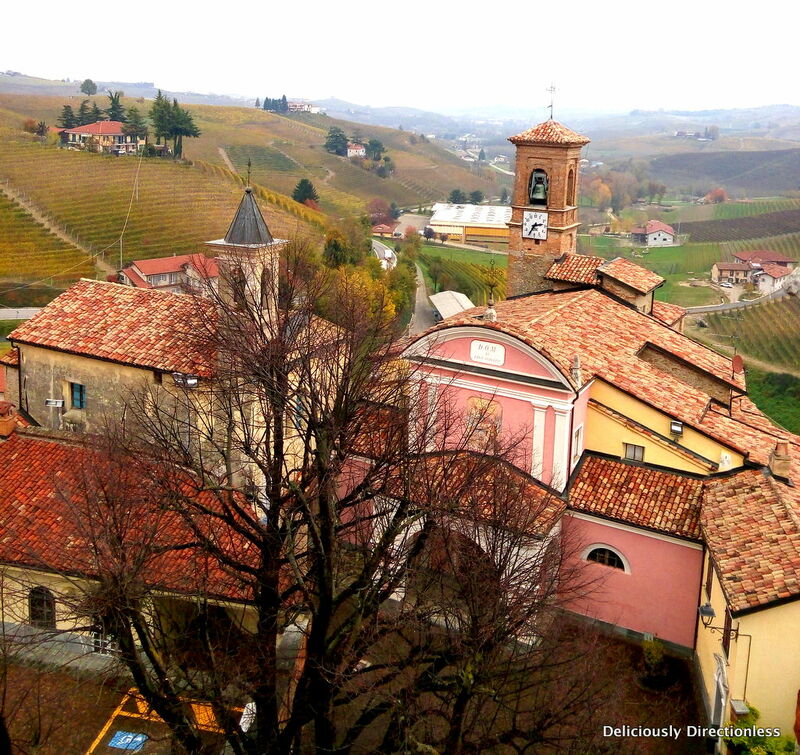 After a wine-fuelled morning, we headed to Barolo – for more wine! The Cuneo province of Piedmont (which includes Alba) is one of the most fertile in Italy, and is known for its quality wine. The River Tanaro divides the hills into Langhe and Roero regions, each of which produce very distinctive wines. Langhe is famous for its red wines – the young Nebbiolo, the fruity Barbaresco aged for at least 2 years, and the robust Barolo, known as “the king of wines and the wine of kings”. Barolo itself is a tiny town, with just a few houses, but it’s responsible for some of the best wines to come out of Italy. The Barolo Castle stands on a hilltop, and today houses the Wine Museum, which delves into the history of winemaking. It’s an interactive, multi-sensory experience, and quite a fun museum to visit. The best part of the museum is the cellar, which is where you can sample wines from several local winemakers. You can get to Alba by train from Turin or Milan. 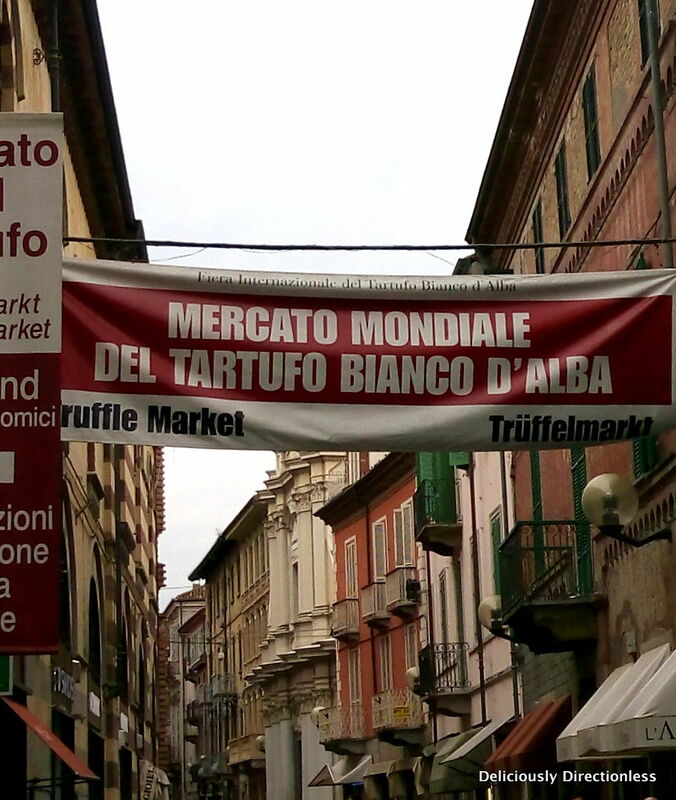 There are bus services between Turin and Alba as well.The Alba International White Truffle Fair takes place every year from the 1st weekend of October to mid-November. Exact dates are announced on their website. 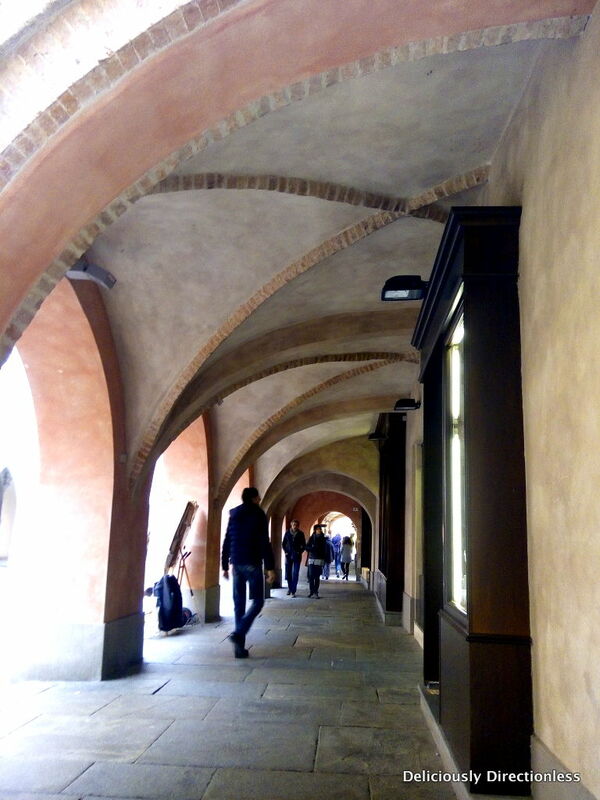 Welcome Piemonte offers guided tours in the region, as well as many audio guides. They can arrange for your travel and stay, and offer food recommendations as well. 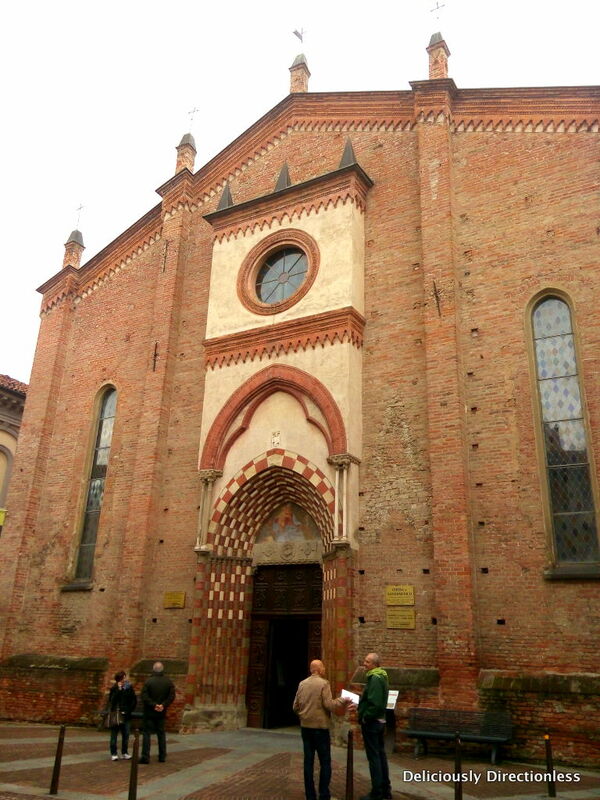 Disclosure: The guided tour in Alba and Barolo was courtesy Welcome Piemonte.